Shrimp is an often-overlooked protein source that many people flat forget to add to their grocery list. I think that's a shame, because shrimp are chock-full of protein, cook ridiculously fast, and taste awesome! 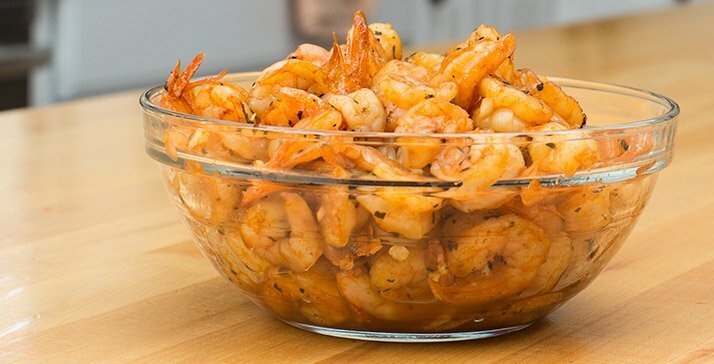 If you're no shrimp wimp and want to add some new flavor to your nutrition regimen, try this delicious, extremely easy, and nutritious recipe. None of the ingredients are difficult to find. In fact, you probably already have most of them in your spice cabinet! All you have to do to kick-start this tasty meal is throw the shrimp in a bag with the rest of the ingredients, and shake it up. After baking or grilling the shrimp for a few minutes, you'll have an excellent entrée or start to any meal. Put these shrimp on some greens, or if you don't have to eat gluten-free, on some brown rice! Kendall is a NPC Bikini competitor, personal trainer, and received a Bachelor's Degree in Biological Sciences.